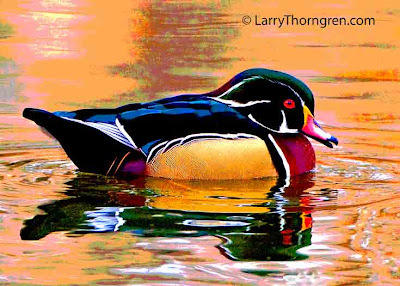 Wood Ducks are among the most beautiful of birds. This one was swimming in a pond in Boise, Idaho, with the golden reflection on the water coming from a nearby office buildings' golden windows. I posterized the already colorful result and ended up with this "wild photo". Frankly speaking that I have seen this Wood Duck for first time.This looks colorful.I like its colors.Thank you for this photograph.